Where guests become friends! 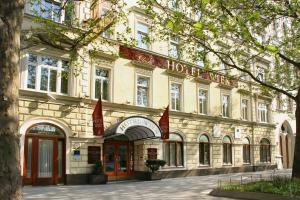 The Austria Classic Hotel Wien is a traditional Viennese house which has become a popular City hotel. We are noted for being professional and efficient, but at the same time, creating a friendly family atmosphere. Our central location, modern accommodation and Viennese charm are appreciated by both business and private guests alike.Start the day with a breakfast on our terrace. Use WLAN Internet in the whole hotel free of charge. Relax in our sauna and train in our gym.Comfortable, quiet rooms with bath or shower, toilet, hair dryer,telephone, TV, radio, WLAN Internet, safety deposit box and Minifridge. Rich buffet-breakfast. Hotelbar. Parking free of charge and garages for our guests. Conference room. WLAN. Sauna & gym.Enjoy Vienna! For seminars, presentations and small meetings the Austria Classic Hotel Wien in Vienna is the right choice for you. This family-run Hotel is in an extremely convenient position to be reached by car, train or plane. Our classic elegant seminar room with 25 m² offers room for 12 people. The technical equipment includes Smart-TV, Beamer, DVD- Recorder, Flipchart, Whiteboard, Overhead-Projector, Internet access and WLAN for all seminar participants. Further rental equipment can be organized upon request.